I found this lovely little topper kicking about in my scraps box! I think it might well be Hunkydory but can't be entirely sure. pretty much like they went together, so that's what I did! I added some lace to the topper & a scrap of matching CS behind the sentiment. Both are popped up on foam pads for dimension! Oh this is gorgeous Dawn, I do love the beautiful butterfly and that lace is gorgeous. A lovely card Dawn. Such a pretty topper and love the addition of the lace. Love the lace with the beautiful butterfly! Great colors too, wonderful card! 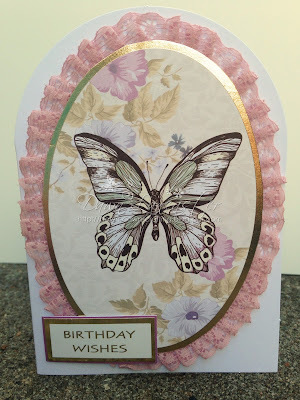 That butterfly really great image Dawn..lovely flower paper too..sweet romantic card you made..luv it..
WOW! Stunning, Dawn! Love the ruffled lace and shiny gold paper behind the image.